Toyota has just made a big development regarding hydrogen… and we mean that literally! The Japanese automaker known for selling the Mirai hydrogen fuel-cell powered car in California is now launching a real world evaluation of the non-polluting technology in a BIG Class 8 semi truck. Currently in California 16,000 diesel trucks operate, according to Toyota Executive Vice President Bob Carter. Toyota’s hydrogen truck utilizes a system of duel fuel cell stacks from the Mirai. These combine for pressurized hydrogen and generate atmospheric oxygen via catalytic membranes. That creates water and the process generates electricity as a byproduct and emits only water vapor. The hydrogen that the truck uses is stored in special tanks stacked behind the truck cab. Meanwhile the fuel cells are installed beneath it. All together the power twin electric motors have a combined output of 670 horsepower and 1,327 lb-ft of torque. You read that right, the hydrogen truck is on par with many heavy duty diesel engines. Toyota’s truck incorporates a lithium ion battery with a capacity of 12 kilowatt-hours stores excess electricity generated by the fuel cell. As an additive measure, the truck’s regenerative braking system also provides an energy boost when needed. According to Toyota, the truck can actually travel over 200 miles per fill up while pulling a full load. However, from we read the truck still won’t stray too far from the ports since available hydrogen filling stations are few and far between. 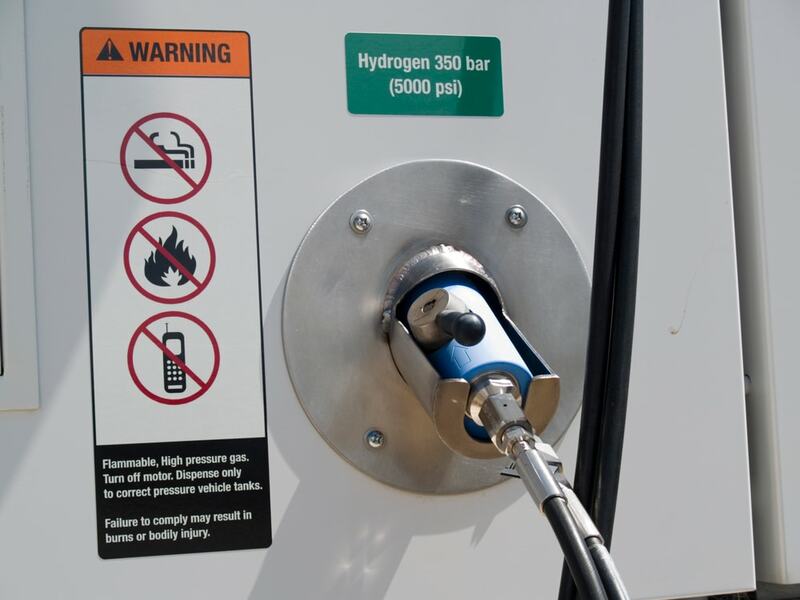 This has been the most significant hurdle in getting hydrogen powered vehicles as a major gas, diesel and plug-in electric cars. Toyota is not the only one with thoughts on the matter. A Utah-based startup, Nikola Motors, is also working on developing a similar truck. This one would be meant for long haul operations up to 1,200 miles between fill ups. Thus the small hydrogen infrastructure issue is addressed. Nikola is even planning to build their own nationwide network of hydrogen stations. These would in turn reverse the fuel cell process by using solar-powered electrolysis to crack water into hydrogen and oxygen. Conversely, Meanwhile Tesla’s CEO Elon Musk has gone on record to call hydrogen an “incredibly dumb” fuel. His company is in turn working on an all-electric, battery-powered semi. Tesla is set to reveal this car in September with an eye on production in the next year.